Do you carry out Cosmetic repair? This is a common question that we get asked, and the answer is YES. We understand that accidents happen, and rarely at a convenient time. Chichester Cars Ltd are here to help every step of the way and can cater for both private (cosmetic repair), and insurance jobs. Our personal experience is that many do not claim on their policy if the amount is under £1,000, which is to ensure there is no impact on their insurance premium, once the time comes to renew. However, if you would like to claim on your policy, simply click on the Insurance Work link and this will give you more information on how we can help. Why choose Chichester Cars Ltd? 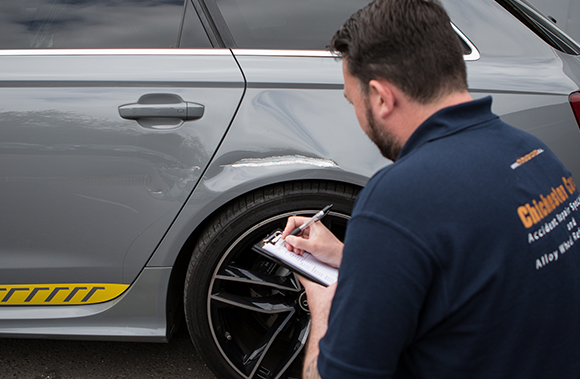 If you would like to pop in and see a member of our team to discuss your local accident repair service needs, please do – no booking or appointment is necessary. Alternatively, for private quotes fill out the form on our contact us page and we will get back to you as soon as we can. Website Designed by Spirit 360 from Spirit FM | Copyright 2019 Chichester Cars Ltd.